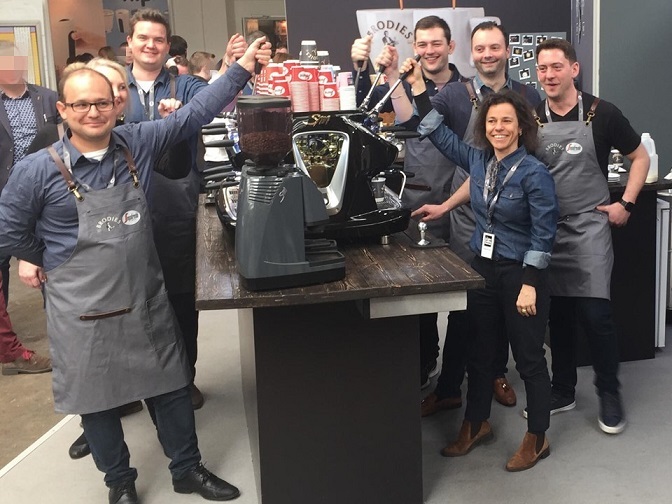 LONDON, UK — Brodies Segafredo Zanetti UK presented at the London Coffee Festival with the latest coffee products and launched the new La San Marco V6. The new blends presented were the Segafredo Organic and Rainforest Alliance blends and three limited-edition filter coffees hand-roasted in Scotland specifically for the London Coffee Festival: the Costa Rica Las Palomas, the Nicaragua Santa Maria, and the Rwanda Kinini Rebero. The growers of Kinini Rebero visited Brodies Segafredo’s stand so there was a unique opportunity for growers to meet the roasters, baristas and consumers all on the same spot. “It’s a privilege to be part of this community and be able to share our love for coffee in such an event. We thank our partners that visited us at the stand, and the other industry operators for the exchange of ideas and knowledge. I personally thank the Team for an incredible work and enthusiasm that translated in a very successful show for us” says Pilar Braga, Managing Director of Brodies Segafredo Zanetti UK.